Challenge 11… we’re getting there. From now on all following challenges will be about learning a new programming or scripting language. I’ll be shown how to compile, execute and debug a program/script. In this challenge I’ll be working with some C code. I’ve never written any C in my life, only C# but I doubt it’s the same. Well, I’ll see when I get to the code. The C program counted from 1 to 10, writing each number to the display and wrote a message in Unix cpgm.output. I’ve checked the message and wrote it to //pds.data(cmsg1). Now I need to modify the code. 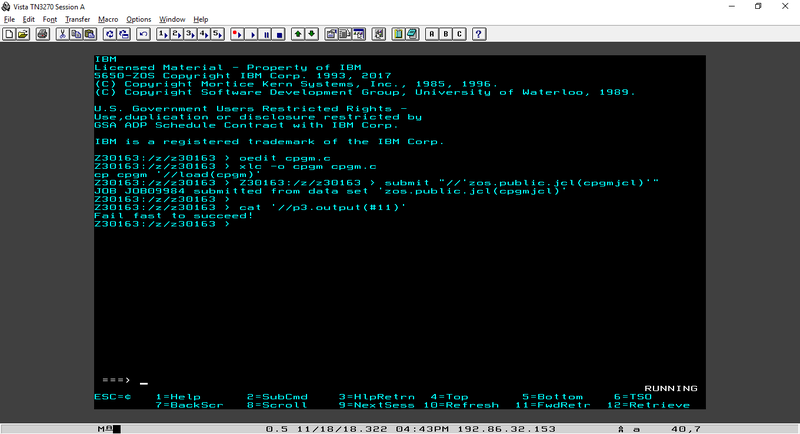 I need to change the text it outputs from My first C program on z/OS to Fail fast to succeed!. I’ll edit the file using the primary command oedit cpgm.c. I’ve highlighted the most interesting part of the code. Line 000021 is where the message needs to be changed. Line 000028 is where they display the code to write text to a DD name. To clarify the code, my first guess is that they open the connection using the fopen function, then pass the DD parameter as DD:DDNAME and the second parameter w probably stands for write (to clarify the action they want to perform). I know the comments at line 000026 and 000027 say comment/uncomment this to write to a Data Set but I’m not sure if I actually need to do it? I’m just going to assume we don’t need to as they don’t instruct us to do so in the assignment. Now I’ll save using F3, compile and run using the previous commands. 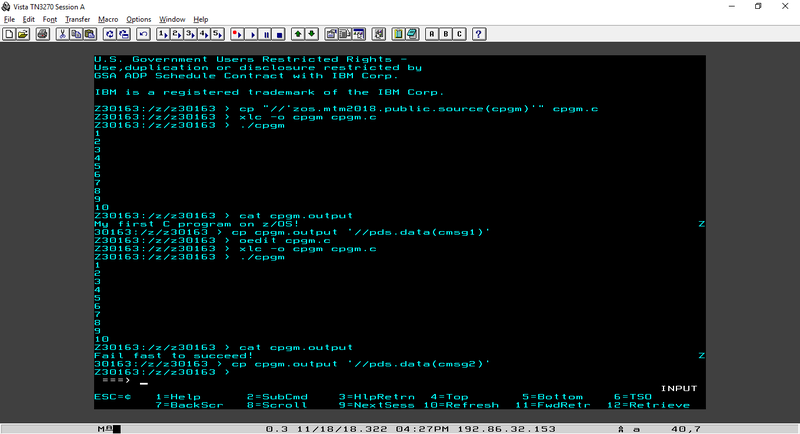 And lastly I’ll read the output and write it to pds.data(cmsg2). That’s done! 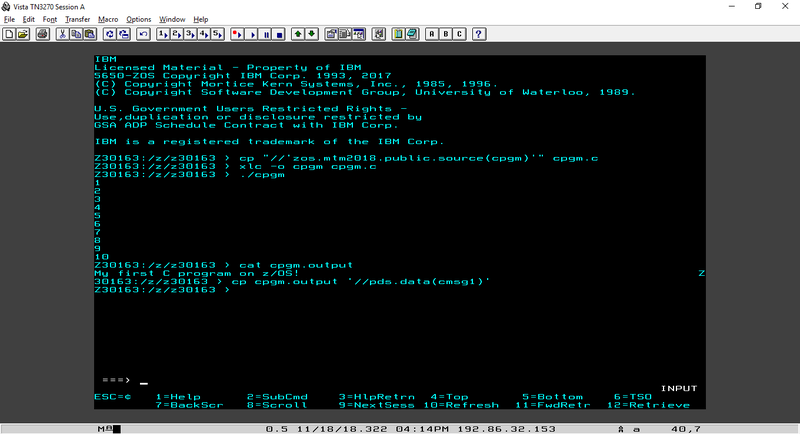 I’ll now copy the C executable module from my Unix file system to my MVS data set using cp cpgm ‘//load(cpgm)’. Now we’re ready to exit omvs. I’m told there are multiple ways to compile C code. We can also compile C code using JCL. We’re going to submit the JCL using tso submit ‘zos.public.jcl(cpgmjcl)’ as we need the output to be inside P3.OUTPUT(#11). Is HANDLER here DD:HANDLER inside the C-code? It probably is. Oh schnitzel, I’ll go and do that. I kind of gave it away I think? Oh… they give it away too when I read a bit further. No harm done. I know… I try to release periodically but work and free time won’t allow me to. But I already prepared a lot of stuff for the coming two weeks. I want to devote the entirety of december to challenge #15! Hi Peracio, did you mean to post this as comment for challenge #13? Do you need any help?